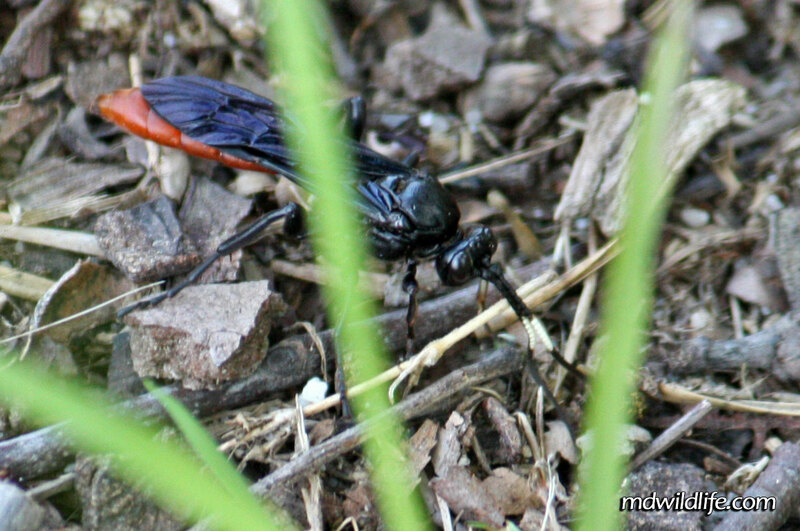 Digger Wasp snoops along the ground at Idylwild WMA. The Ichneumon Wasp is a fairly popular genus of wasp in North America. I’d like to apologize for the stalk of grass in the way, as well. It’s the best shot I had from the front to show off his long snout. And the snout is key here, because that’s actually how I arrived at the id. I was going with the obsessive compulsive “Digger Wasp” for the longest time on this one, but the long snout kept convincing me that wasn’t true. The body type still screamed digger at me, but I couldn’t ignore the nose, so I flipped through a few more pics at bugguide.net and I’m settling on an Ichneumon, and I think that’s correct. I captured this guy at Idylwild Wildlife Management Area in late summer, running along the forest floor.